It's just two weeks until the event that’s all too often touted as the pinnacle of our sport, and the organizers still don’t have a permit from the Coast Guard to run the show. Following Artemis’s fatal capsize last month, safety recommendations (all 37 of them) expected to mitigate the risk of another tragedy have been submitted and attached to the Coast Guard’s permit. Not surprisingly, however, not all the teams are agreeable to the regulations being proposed. Over the past two days, arbitrators have attempted to mediate with the teams--both as a group and individually. If agreement is reached, the regulations will be adopted into the Class Rule and the Protocol. 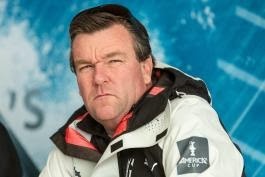 But as PRO John Craig notes, if the “sticking” points cannot be resolved among the teams, the matter will be turned over to the International Jury. From there, it’s anyone’s guess as to the outcome. When will the saftey regulations be published and a permit executed by the Coast Guard? JC: There may be one or two sticking points that we can’t get around. Changing a Class Rule requires all four teams to agree to it. A Protocol change requires a majority and so that’s a little easier. If we get stuck, it may end up going to the Jury to make a determination, but once that’s done we would look to attach the Jury’s recommendations with the permit. But basically they would be small tweaks--the majority of the teams are in agreement with the new safety regulations. Can you elaborate on the “sticking” points? Do they involve modifications to the boats? JC: One of the examples in the safety recommendations is to make symmetrical elevators on the rudders. The elevators are lifting wings on the rudders that you can’t adjust, and they are currently asymetrical because they can’t go outside the beam of the boat. So you have one lifting elevator that’s shorter than the other. Iain Murray’s recommendation was to increase the size of those, and you could make them symmetrical and the same size. Some of the teams are saying, “We’re happy with where we are, we don’t think that’s a change we need to make.” Maybe the negotiation is just to make them a little bigger because the bigger they are, the more stable they are. When changing something seemingly small like that, there must be a ripple effect that requires other changes on the boats? JC: It does, and it doesn’t. We’ve got a lot of sailing in July that the teams will use to train and sail. If the regulations are approved and adopted by all the teams, there’s still time to develop further in July before we move into priority racing time. With Artemis out until late July, the competition for July has become more of an extended training time? JC: Yeah, but it’s still got value. The winner of the round robin in July will get the opportunity to choose to go either into the semifinals of the Louis Vuitton or right into the final. For the matches where Artemis is not there--possibly through late July--ETNZ and Luna Rossa will use those as training days. It’s not what we were looking for, but I think it’ll still prove interesting. I wouldn’t be surprised if Luna Rossa and ETNZ decide on one of those days Artemis is still out to invite the “other” team on a friendly “let’s go practice” type deal. What else do the new safety regs cover? JC: There are three sections that involve Class Rule changes, Protocol changes, and Racing Rules of Sailing changes. For example, changes to the Class Rule include increasing the weight of the boat. When the box rule was first created, the architects of that rule never envisioned the boats to foil, and the designers have managed to make that happen. As a result the structural loads have gone up significantly because the boats are getting lifted out of the water. One of the regulations Iain put forward is another 100 kg of weight that could be added to the boat for structural purposes to increase the structural strength around the main beam and around the load cases for the foils. Another recommendation was to make the farings clear or opaque so that you can see through them, making it easier to find somebody if they’re under the water. Other recommendations require two rescue divers--one on each of the team chase boats, and allow the team chase boats into the race area during the racing to follow the boats closely. There’ll be a paramedic on board one of those rescue boats. We’ve increased the certification of some of the personal gear, the helmets, and we’ve also developed two systems: One is a flashing strobe light that the guys wear on their lifejacket which is extremely high powered--Stan Honey and our technical gurus developed it--to make it easier for divers to locate people underwater quicker. We’ve also developed another system in the event that all the guys go into the water; it’s like a key fob you have in your car. If they’re safe, they click it, and the response shows up on a display on the rescue boat to say he’s OK. If guys don’t respond, we’ll know who we’re looking for and what position on the boat they were at. Another big one is a move to soft marks. The VIP mark boats that we used to use saw the race boats go around the VIP mark boat itself--the teams will now go around a soft mark. Much of this drama plays out in your jurisdiction - on the water. What have you had to adjust on the racecourse to mitigate the risk of a capsize? JC: As far as the racing for this summer, we’re doing what we can with boundaries and creating safety zones or larger buffer zones between the race track and the spectator fleet. It is going to be challenging to get these guys around the track, that all being said, Luna Rossa and ETNZ have almost 20 days of racing together in some pretty windy conditions, so I think when we get to go, we’ll see what the boys can really do. I think it’ll start out slow, and it’ll build. When we get to the Cup itself, the racing will be pretty spectacular. We’ve looked at wind limits; the scary part is 20 knots of breeze and 3 knots of ebb is a lot different than 20 knots of breeze in a flood. Fortunately the way the schedule has worked out, a lot of the regatta is in a flood, so while unplanned, that’s been a good piece of luck. With the wind limits, boundaries, and run-offs, there's also all the other stuff that we’ve done as far as the rescue side of the equation. After Oracle capsized, we required the boats to put 1000 liters of air in the top of the wings so a lot of the teams have come with either an air bag on the top: When it blows open, it stops the mast from going deeper in the water. Others have actually put airbags inside the wings themselves. We’re hopeful that will reduce the damage if we do get into a situation. From your observation, what could be changed on the boats to tame these beasts? JC: We originally started out with two wings--the larger one we’re with today, and a small one. The bigger one was based on the lighter air venues that we thought we would sail with the 72s in the second leg of the America’s Cup World Series, which didn’t happen. I think if you polled the teams now they might suggest the smaller wing was a wiser option, but again at the time we didn't see foiling, and the boats were supposed to do the 2013 ACWS series leg when that decision was made. Have you tested the new boundary system? JC: Today is our first day with the boundaries up so we’re going out to test that today. We’re pretty confident that we’ll be able to get the buffer we’re after. During the review the sailors commented that they needed 45 seconds from the edge of the boundary to the spectators if something went wrong, so that’s what we’ve been trying to create: 45 second run-offs around the course so if the guys get into trouble they have a place to go. As PRO, what’s been the most challenging aspect of AC34? JC: Working through what these new boats have created. We were thinking they’d do 33-35 knots, and they’re now doing 45-46 knots. By foiling and by the designers being as smart as they are and getting the boats to fly/foil, this has changed what we thought we’d be dealing with. The most challenging part of that has been adapting racecourses, safety, working with the Coast Guard, and the teams getting to a place where everybody is comfortable so that we can race these boats but can also ensure a good show that works for all the components outside the racing. As we’ve changed the racecourse, times, and wind limits, that’s also had a trickle down to the commercial side of it. The interface with all of those bodies as you make a decision is a lengthy process--it’s a lot of time. Once racing starts, what will your specific role be? Where will you be? JC: I’ll be back to running the races on the water--out of board rooms and meetings and running races, which is what ACRM is all about. I’ll be on the signal boat and monitoring the wind very closely to make sure we stay within those wind limits. If it looks like it's not going well, guys are in trouble, or conditions change, I can be ready to call it. After all this, running the Kiteboard Course Racing NA’s a few weeks ago must have been easy? In competitive sport there are wins and losses. For sailing superstar Sir Ben Ainslie, a helmsman for Oracle Team USA, winning is something that he’s very good at, but last month the 36-year-old Brit experienced an unexpected loss: that of close friend Andrew “Bart” Simpson, his lifelong sailing buddy, in a [well publicized] sailing accident on San Francisco Bay in which Simpson’s team Artemis Racing capsized during a regular training session, trapping Simpson under Artemis’s AC72. The experience has been both devastatingly sad and sobering for Ainslie. The four-time Olympic medal winner is back on the water with Oracle Team USA after attending Simpson’s funeral in Great Britain and breaking the previous record in the Round the Island race held off the Isle of Wight last weekend. 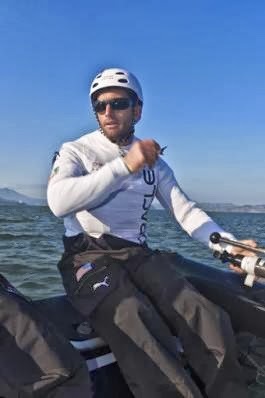 Here he shares his thoughts on AC34 and the absolute need for a safe competition. The infamous San Francisco summer breeze is now upon us: How has it been on the water? Do you have any apprehensions about the boat you’ll be racing in these conditions now the Louis Vuitton Cup is just a month away? BA: We’ve been sailing for the past couple of days, and I’ve been doing more helming, steering the boat downwind--foiling--and it does take a little bit of getting used to. They’re certainly very fast boats, and you have to be absolutely on your game to sail them. I think that in the right conditions the boats are manageable, and if the safety recommendations being put in place for the event are at the right level to sail and race in a safe manner, that’s what we all want. There have been statements made publicly that you had considered stepping down from the Cup following the Artemis tragedy. How real was that consideration? BA: I think like many of these comments that it may have got blown out of proportion a little bit, which made it sound little bit more over the top, but it certainly wasn’t my intention. It was, however, something that I’m sure a lot of people felt at the time because we were all so devastated that something like that could happen. If you were very close to Bart, like a lot of us were, actually seeing that something like that could happen does make you evaluate a lot of things. I’m not saying it's something I had to struggle with for very long, but I do think there are moments like this where you do think about your life, what you’re doing with your life, and what it’s all about. How has the accident impacted you and the sailing team at Oracle? How are you now looking at the way you do things, whether on the water or on the boat? BA: Like all the other teams, we’ve looked long and hard at how our boat is prepared, how we sail the boat, the safety equipment, and if something were to go wrong, how to recover the boat. I’m absolutely certain the other teams have done exactly the same thing. It’s the sensible response to a disaster like that. None of the teams ever want anything like this to happen again. You look very long and hard at your processes and your equipment and the conditions that you’re prepared to sail in. How is morale at Oracle Team USA following the accident? BA: Of course everyone was devastated both by the accident and what happened. But since I got back here on Monday [June 3], the guys are getting on with it and working really hard. I was really impressed to see the changes being made to the boat with safety in mind. We’re moving forward and preparing for the America’s Cup. From your observation, what are some of the ideas for improving the safety aspect of racing on the 72? BA: A lot of them are just very common sense, such as having more high-visibility clothing, maybe more durable helmets depending on the specific case in the individual teams. Even before this most of the teams were carrying spare air and knives, and now people are taking that much more seriously. The technical side is the more gray area because the boats are obviously designed to sail in a range based on a certain rule, so there’s a very fine line between making some big changes and retaining the integrity of the event. It’s not that easy, but there’s a lot of goodwill going into these changes that are being implemented, and I’m confident they’ll come through. Do you think the wind limit needs to come down? BA: I think that’s the biggest step they can take to try to avoid a capsize further down the line in the competition. I think the wind limit will come down--that’s the recommendation from the safety committee, and I understand that the teams have agreed to that. It’s been said, especially in light of the tragedy, that sailors at the top of their game, like yourself, are highly competitive, and chasing the next big challenge is simply part of what you seek--would you agree with that? BA: It’s all very competitive, and everyone wants to win. In an event like this with a new class of boat and a lot of unknowns, we have to careful and realistic about how hard we can push these boats and what they’re capable of. I think we just have to use a lot of common sense to get us through this difficult period, that’s all. Do you consider yourself highly competitive? Is this the kind of challenge you were after? BA: Sure, I’d say I was highly competitive given the nature of what I’ve been doing for the last 20 years. As a sailor, you’re there to compete, part of the challenge with this America’s Cup has been the boats. There’s an element of the unknown with these boats, and what we’re all concerned with foremost is the safety of the equipment, safety of the racing, and safety of the competitors. We have to do everything we possibly can to ensure that. With two completely different AC experiences (ETNZ in 2007) and both very different to the Olympic path you’ve been on all these years, what’s attractive to you about the Cup? BA: Its history as the oldest sporting trophy in the world. For us Brits, there’s an element of wanting to bring it back to where it all started in 1851. It’s a huge challenge because of the technical aspect, and with a lot of the top sailors from Olympic classes and smaller boats now competing in the event. For sure, in terms of big boat sailing, it's the pinnacle of our sport. How are you finding the current edition of the event compared to 2007? BA: It’s definitely a bit different, isn’t it [laughs], with the wing sail and the multihulls. It’s a totally different challenge. The version 5 boats were really getting at the top of that class--that rule--and were really close in performance. Now the boats are at different ends of the spectrum. It’s much more about the design of the boats and which team can develop their boats as quickly as possible and get close to maximum performance. That will be the team that ultimately wins. It won't necessarily be about the best starting helmsman or specific adjustments to the headsail, for example, like it was in 2007. It’ll all just be about speed I think. How do you find sailing in the big team environment with its many personalities and politics, transitioning from your Olympic sailing to the AC? What tranfers from your Olympic experience to the Cup arena? BA: It’s a completely different style of sailing, but what I’ve learned in small boats: It's just about hours on the water and trying to become good at making decisions about what’s working and what’s not. It’s the same as what we’re trying to do here with the 72s as we develop these boats as quickly as possible. It’s really about having good people and making the right decisions. Even in Olympic sailing, it’s not really about one person [laughs]--there tends to be a big team in the background helping out. The Cup is just a much bigger scale.